Ronald Lee did his homework when looking into his first small business venture. He interviewed different franchisees about the different companies they had decided to buy into. There were varying degrees of happiness and content, but he was wowed by several UPS Store owners and how happy they were. “I contacted UPS and I knew what my requirements were. The model seemed to fit me right away. I interviewed five separate owners who managed five to six stores each. Everybody seemed happy. They all told me I should have done this five years earlier. After setting his sights on where he wanted to go, he was referred to Stearns Bank by Guidant Financial for an SBA loan. Following a discussion with Stearns Bank SBA lender Brenda Carlson and loan assistant Kaitlin Fredericksen, Ronald started to go through the pre-approval process for a loan. He was pre-approved within days. Ronald emphasized needing a quick turnaround, but even he was surprised how fast Stearns Bank worked. After being pre-approved, Ronald used Stearns Bank’s SBA customer portal to easily upload the documents he needed to complete the loan processing. “It was easy to use and straightforward. I was able to upload documents while on the road. It was convenient for me,” Ronald said of the portal. Ronald officially became a small business owner on April 12, 2018. 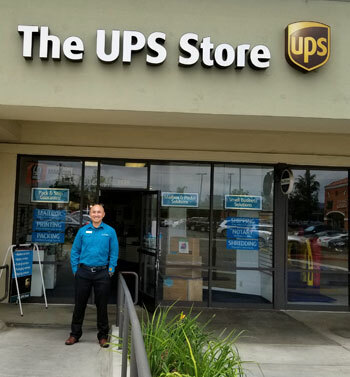 He’s excited about what the future holds for him and possibly acquiring more UPS stores in the future.